Play Overwatch® Free May 25–28 on PC, PlayStation®4, and Xbox One! Attention, recruits! The second anniversary of Overwatch is around the corner, and if you haven't already had the opportunity to suit up and save the world as one of our heroes, now's your chance. From May 25–28, we're calling on all prospective agents: assemble your teams and dive in during the Overwatch Free Weekend on PC, PlayStation®4, or Xbox One! For this free weekend, we're making Overwatch's full roster of 27 heroes and 18 maps available for play in a variety of modes, including Quick Play, Custom Games, and the Arcade. Players will also be able to level up, earn Loot Boxes, and unlock a variety of different customization options for their heroes. Plus, if you decide to purchase Overwatch after test driving the game, you'll get to keep any progress that you made during the weekend—just be sure to use the same Blizzard, Xbox Live, or Sony Entertainment account that you played on. 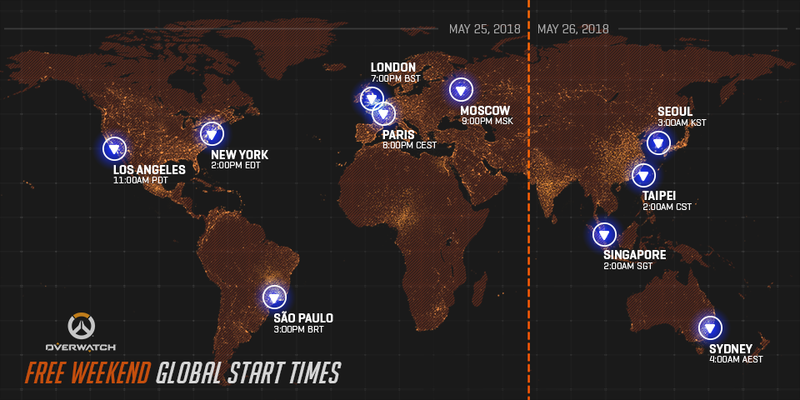 The free period will begin on May 25 at 11:00 a.m. PT and end on May 28 at 11:59 p.m. PT in all participating regions across all platforms. If you'd like to see when the weekend will go live in your region, check out the guides below. For additional time zone assistance, please visit timezoneconverter.com. Before your watch can begin, you'll first need to install Overwatch on your chosen platform. Every platform is a little different—to install and play on May 25, please follow the instructions below.